We can understand that God Almighty is providing Fear and Punishment. Therefore, there really isn’t need for people to provide fear, terror, or bullying to other human beings or animals. God Almighty would prefer if all souls were in heaven. God would prefer that no one suffered. Why are people and animals suffering? The suffering is due to karma. However, it not just about improving our karma. We need to improve our eternal relationship with God. Actually, we are reawakening our eternal relationship with God through Hare Krsna Bhakti Yoga. It is apparently the fact that it is sometimes believed that by putting pain, terror and suffering on other human beings or animals that is improving their karma. I would assume that those who put fear, terror, pain, and similar punishment on human beings or animals will also have to suffer bad karma for giving trouble to other beings. A government may have to arrest someone and punish them. This depends on the circumstances, however, extremes in punishing a criminal should not be necessary. Torture should not be necessary. Of course, there is death penalty when it is proven that someone has committed murder. The death penalty should help the criminal to get better karma for their next birth. Still there should be due process of law and people should not be taking the law into their own hands. All conditioned souls are trapped in this material existence which is real only because God Almighty is providing all of material existence as His personal dream. The Vaisnava Goal is generally qualifying for entrance into Vaikuntha Dhama where there is no death and all lasting happiness. Lord Sri Krsna Himself gives pointers on the most ideal ways of qualifying for entrance into Vaikuntha Dhama. 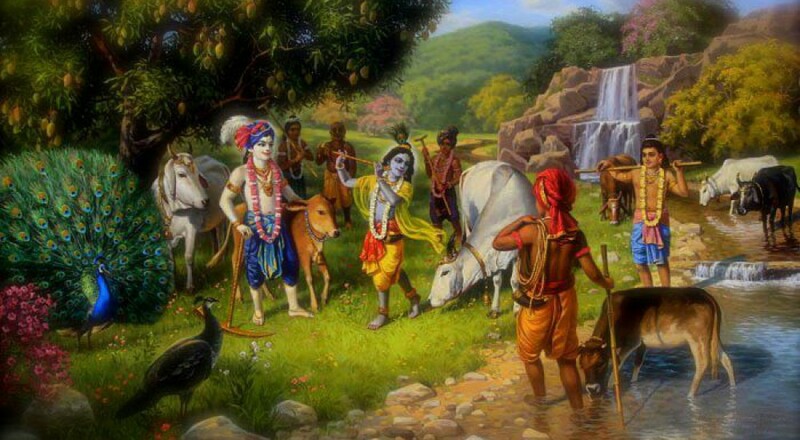 Bg 18.68 — For one who explains this supreme secret to the devotees, pure devotional service is guaranteed, and at the end he will come back to Me. Bg 18.69 — There is no servant in this world more dear to Me than he, nor will there ever be one more dear. SB 11.29.26 — One who liberally disseminates this knowledge among My devotees is the bestower of the Absolute Truth, and to him I give My very own self. SB 11.29.27 — He who loudly recites this supreme knowledge, which is the most lucid and purifying, becomes purified day by day, for he reveals Me to others with the lamp of transcendental knowledge. SB 11.29.28 — Anyone who regularly listens to this knowledge with faith and attention, all the while engaging in My pure devotional service, will never become bound by the reactions of material work.